Fitment*2009-2014 Ford F-150 (Not For Harley Davidson And Raptor)Package ContentThis item includes 1 pc Bolt Over/Overlay/Bolton Horizontal Billet Grill Insert with Powder Coated surface finish, along with mounting hardware and installation manual. Please note the material is Stainless Steel and color is Black.IntroductionTrying to get away from too much chrome? The black iGrille is your answer. Made from aircraft grade stainless steel, the black iGrille is the better choice to plasti-dipping or painting black a regular grille. The black iGrille's matt black surface is powder coated to be durable, UV resistant and long lasting. Its stainless steel body also protects it from wear, and harsh weather conditions. Each bar on the black iGrille is twice as wide as the competition's - making it denser and more aggressive looking. Some people have reported a whistling sound from their billet grille when driving up to 70mph. The black iGrille doesn't have this problem! The iGrille is precision fabricated by CNC machines, and bonded together by rivets instead of ugly weld marks like other grilles. Not a whistle will be heard from the iGrille no matter how fast you drive. The black iGrille is the grille you deserve! 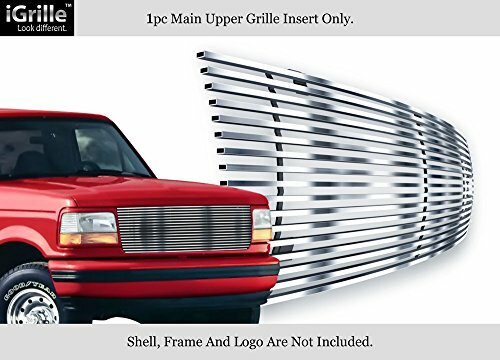 Fitment*1992-1996 Ford Bronco * 1992-1996 Ford F-150 * 1992-1996 Ford F-250 * 1992-1996 Ford F-350Package ContentThis item includes 1 pc Replacement (Cutting Not Required) Horizontal Billet Grill Insert with Powder Coated surface finish, along with mounting hardware and installation manual. Please note the material is Stainless Steel and color is Black.IntroductionTrying to get away from too much chrome? The black iGrille is your answer. Made from aircraft grade stainless steel, the black iGrille is the better choice to plasti-dipping or painting black a regular grille. The black iGrille's matt black surface is powder coated to be durable, UV resistant and long lasting. Its stainless steel body also protects it from wear, and harsh weather conditions. Each bar on the black iGrille is twice as wide as the competition's - making it denser and more aggressive looking. 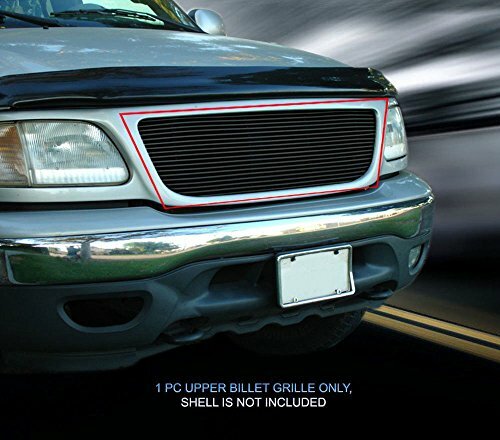 Some people have reported a whistling sound from their billet grille when driving up to 70mph. The black iGrille doesn't have this problem! The iGrille is precision fabricated by CNC machines, and bonded together by rivets instead of ugly weld marks like other grilles. Not a whistle will be heard from the iGrille no matter how fast you drive. The black iGrille is the grille you deserve! Fitments1999-2003 Ford F-150 Honeycomb Style1999-2003 Ford F-150 Harley Davidson Honeycomb StyleIntroduction Black stainless steel car grills are the perfect alternative to chrome grill inserts. In a world full of the same chromed out look, the black eGrille is here to save the day. 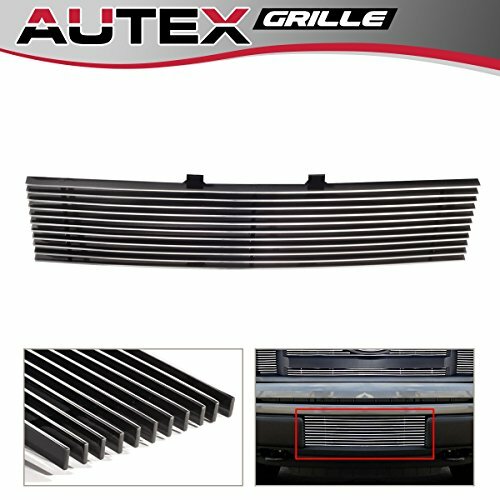 What is the difference between the eGrille and a chrome grill insert? The black eGrille is stainless steel and powder coated for added protection against rusting and wear. Guaranteed to outlast and out perform grilles that are plasti dipped black, the black eGrille is your most durable and stylish choice. 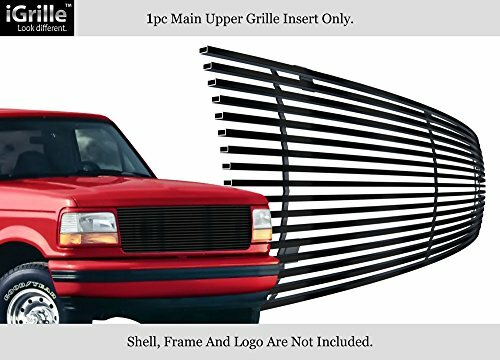 Each bar on this grill insert is twice as wide as the competition and have smaller gaps in between, making it beefy and aggressive looking. The eGrille is fabricated precisely, ensuring a perfect fit with your vehicle. Instead of welding, which leave behind unattractive weld marks, the bars are bound together by metal rivets. Ensuring the grill looks great front to back. The black eGrille is the grill you deserve.Specification*Position: Main Upper*Material: 304 Stainless Steel*Finish: Black Powder CoatedInstallationBolt Over/Overlay/BoltonItem offeredBillet Grille InsertAll Necessary Mounting HardwaresInstallation InstructionNoteGrille insert only, logo or emblem, frame or shell is NOT included. 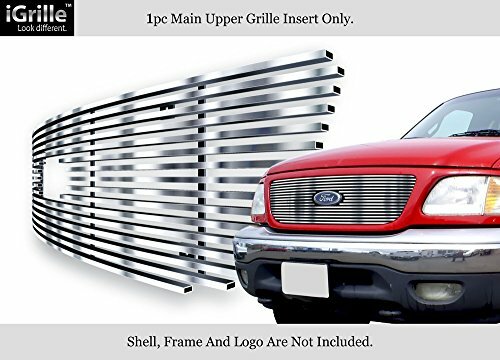 Fitment*1999-2003 Ford F-150 Honeycomb Style With Logo Show * 1999-2003 Ford F-150 Harley Davidson Honeycomb Style With Logo Show * 1999-2003 Ford F-150 Lightning Honeycomb Style With Logo ShowPackage ContentThis item includes 1 pc Bolt Over/Overlay/Bolton Horizontal Billet Grill Insert with Hairlines surface finish, along with mounting hardware and installation manual. Please note the material is Stainless Steel and color is Silver.IntroductionWhat is iGrille? The iGrille is new generation stainless steel grille insert that was made to be different. Only the iGrille has 3D shine. And it comes with silver, chrome and black color. Each bar on this grille is polished or powder-coated on all 4 sides; unlike an aluminum grille which only has 1 finished surface. Made of grade 304 stainless steel, the iGrille far surpasses aluminum grilles for protection against oxidation and corrosion. The iGrille will stay polished and shiny looking whereas an aluminum grille may look tarnished and lackluster with time. Size matters! The iGrille is wider and heavier than an aluminum grille for the same application. At a hefty 6mm in width, the iGrille is 50% wider. 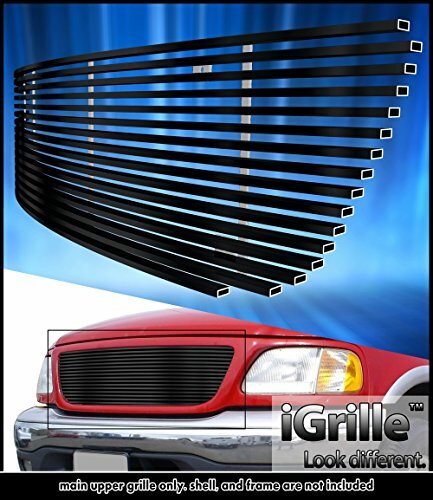 Choose the iGrille for a grille that truly stands out on your vehicle! 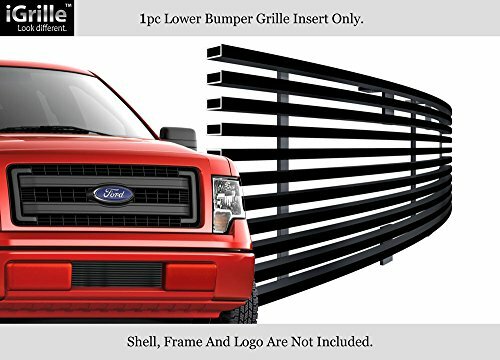 Fitment*1992-1996 Ford Bronco * 1992-1996 Ford F-150 * 1992-1996 Ford F-250 * 1992-1996 Ford F-350Package ContentThis item includes 1 pc Replacement (Cutting Not Required) Horizontal Billet Grill Insert with Hairlines surface finish, along with mounting hardware and installation manual. Please note the material is Stainless Steel and color is Silver.IntroductionWhat is iGrille? 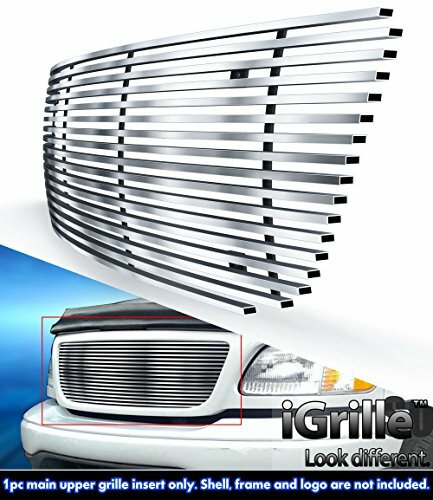 The iGrille is new generation stainless steel grille insert that was made to be different. Only the iGrille has 3D shine. And it comes with silver, chrome and black color. Each bar on this grille is polished or powder-coated on all 4 sides; unlike an aluminum grille which only has 1 finished surface. Made of grade 304 stainless steel, the iGrille far surpasses aluminum grilles for protection against oxidation and corrosion. The iGrille will stay polished and shiny looking whereas an aluminum grille may look tarnished and lackluster with time. Size matters! The iGrille is wider and heavier than an aluminum grille for the same application. At a hefty 6mm in width, the iGrille is 50% wider. 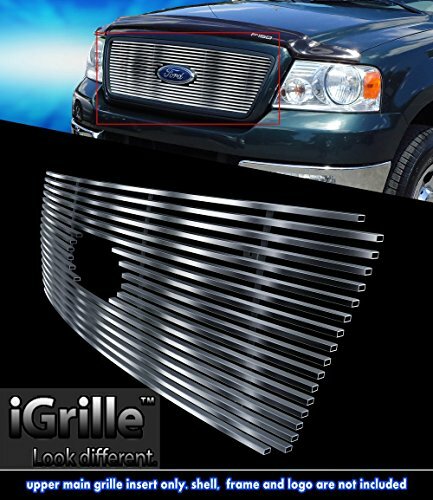 Choose the iGrille for a grille that truly stands out on your vehicle! 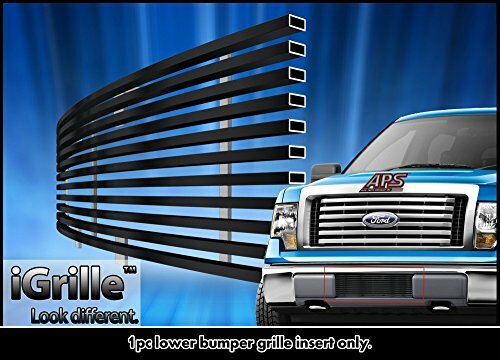 Compare prices on Billet Grill Ford F150 at ShoppinGent.com – use promo codes and coupons for best offers and deals. Start smart buying with ShoppinGent.com right now and choose your golden price on every purchase.